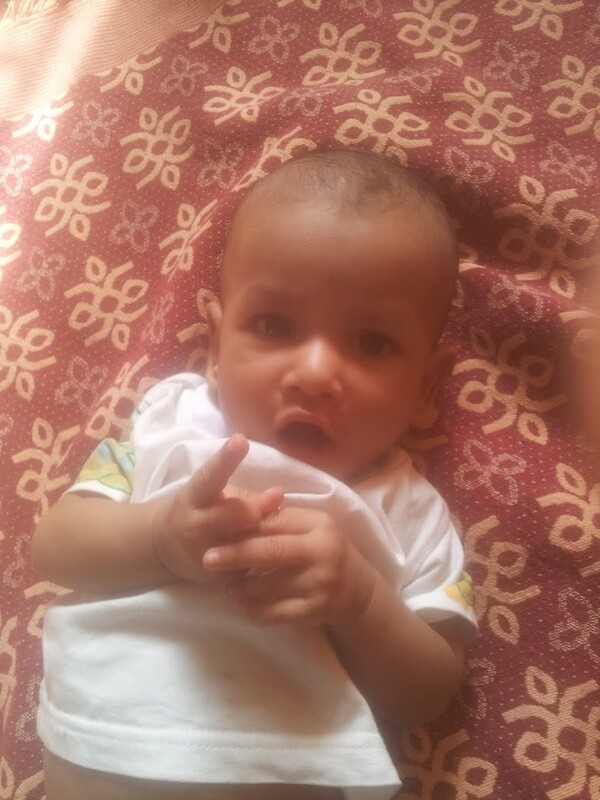 I am raising fund for My 5 months old kid Venudev who is about to undergo Bone marrow transplantation treatment at Apollo multi speciality hospital, teynampet, chennai, India. He is diagnosed with PRIMARY IMMUNE DEFICIENCY and is being treated disseminated TB. Bone Marrow transplantation is the only curative option for this condition. There is no matched donor available in world wide registry so Dr team planning to do haplo transplantation from half matched mother's stemcell. 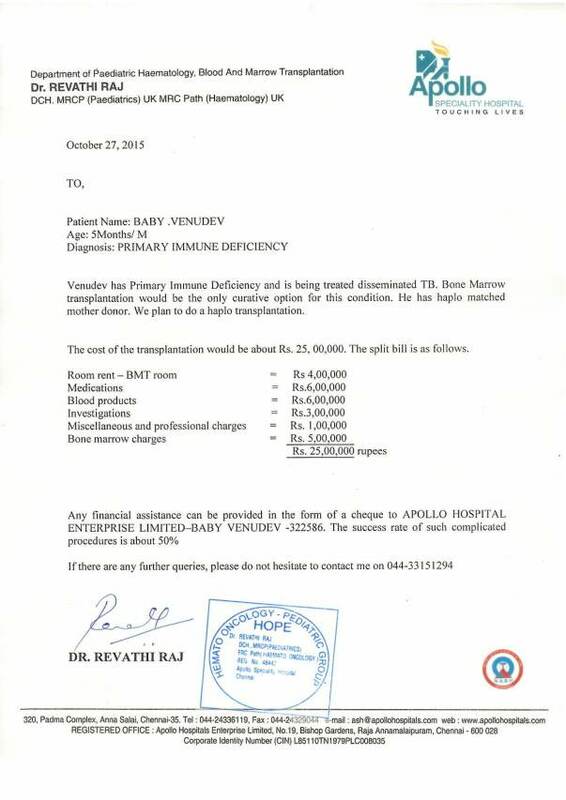 Here is the Transplant estimation cost from Apollo hospital. Please save and open it in image viewer to see it clearly. Life was so beautiful when I became a father of a beautiful baby. But the happiness didn’t last for couple of month. 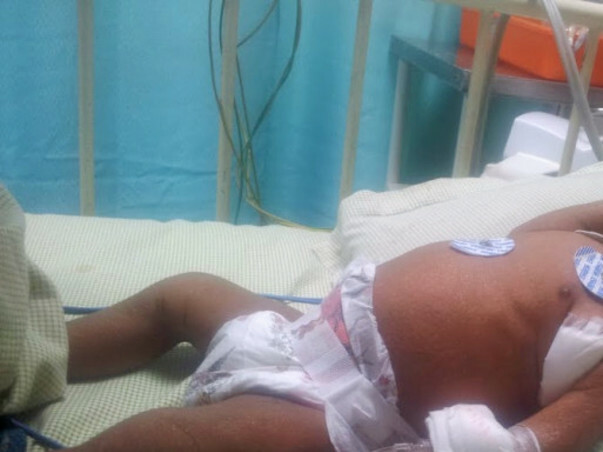 When he was 2 months old he developed skin rashes, fever, diarrhea and under arm swelling(lymph node). We took him to the nearest child hospital and they treated with antibiotics for four days, fever and skin rashes subsided for a while but the WBC count was raised from 32000 to 51000 and the Dr asked us to move to other hospital. 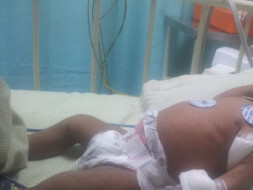 We moved him to Kanchi kamakodi child trusts hospital, Chennai. And admitted under chief senior pediatrics Dr. S.Balasubramaniyan There he was treated with antibiotics for couple of weeks but fever, rashes and diarrhea were not controlled. His liver and spleen enlarged. All possible tests taken and all the tests were negative finally they did SKIN biopsy from the lymph node tissue which was positive for TB. And blood samples send to NIIH Mumbai which resulted that the baby has Immune Deficiency (probable of Interferon Gamma receptor deficiency). DR explained that this is side effects of BCG Vaccine(BCGosis) and my kid by birth has Immune Deficiency. And then (ATT)Tuberculosis medicine has been started fever and diarrhea subsided. Dr suggested that to cure this primary Immune Deficiency, Bone Marrow Transplant is the only solution and as suggested by the doctors from Apollo Hospital to carry on from there to do Bone marrow treatment. In the meantime my kid lost weight he was 6.2kg when he first admitted, after a month he was 4.1 kg he lost 2 kg weight. We admitted him at Apollo hospital to take further treatment and he received Interferon gamma therapy injection to boost his immune system which cost was rs 40000. As he was too thin Protein powder has been given through IV tube. Doctor suggested that the baby condition is not good for treatment so to gain his health we need to continue the medicine. And he put little weight couple of weeks later, we continue to feed him protein powder and ATT drugs. In the meantime underarm swelling grown too much and we had to remove through operation now the swelling is gone but Dr said that it may grow again. Now he is in stable condition so Dr planning to do the Bone Marrow Transplant and further treatment process will be explained by the Dr in the next consultation. Thank you for your overwhelming love and support. This couldn't have been possible without you. We have been continuing ATT drugs almost three years, Venudev had frequent fever, cold and wheezing problems, our visit to the hospitals never stopped. In the meantime, doctor suggested us to have a PGD (Pre-implantation genetic diagnosis) to plan for another baby with proper HLA match for Venudev and also to rule out the chances of getting any genetic problem like Venudev has. But the PGD is Expensive and its painful process, so later she suggested to have normal pregnancy as there are 75% chances to have normal baby without any problem and we can have CVS (Chronic villus sampling) which is a prenatal test that is used to detect birth defects, genetic diseases, and other problems during pregnancy. Me, my wife and Venudev had a test before planning pregnancy at Mediscan-Chennai to confirm the existing problem to identify the same on the new baby. Like we planned we had the CVS test at Mediscan-Chennai on Feb2018 at the 12th week of pregnancy, The test was like poking the stomach using a long needle till the placenta to get some tissue like blood to get the DNA of the Fetus. The test process took 5 weeks which was like 5 months for us we were praying and waiting for the result to be normal. The result came around 17th week of pregnancy.It was again a very tough time for us, The result was Positive for the same Immunodeficiency 27A. We had no other choice than doing abortion, we consulted with our local gynecologist and admitted at the hospital early morning after taking couple of pills and lot of pain inducing injection throughout the day, I couldn't bear the pain which my wife was going through and it was like a normal delivery, but they had to cleanup the placenta on seduction. It was a fully grown fetus of a boy baby. on all the reports except the spleen enlargement. We got discharged and had the rest of the antibiotics injection for another week by making daily visit to the hospital. but the spleen size was abnormal. Venudev had sever fever and enlarged spleen so again we admitted him at Apollo. this time he had more than 20 days of high fever.All the tests including PET CT and some blood cancer related test everything was negative. they added Picc Line in the right hand for long usage. he was on antibiotics and IVIG but nothing helped and then they gave some steroids injection which stopped the fever. 5th may 2018 we got discharged. now he is on ATT, IM injection on odd days and some steroids tab, his spleen is better now but he don't have energy to do normal activities, maybe its because of the medicine he is on now. We don't have a matching donor yet. we are not sure how long his body can tolerate all these medicines. In between my wife's only brother passed away a month back. Still we hoping that one day Venudev will be normal like any other kid. Please keep praying for our baby. Venudev is doing fine and his hickman line is removed. We will be continuing the ATT drugs for three years. There might be NO BMT for three years as suggested by a senior doctor, who was contacted by Venudev's doctor in Apollo Hospitals. His swollen under arm has burst and puss is coming out of it. The doctor has said that this will heal if the ATT drugs are taken properly, along with the additional injection that Venudev receives weekly thrice. We have our frequent visits to the hospital. Routine blood tests for monitoring the side effects of the drugs are done. After a year filled with struggle, our Venudev is turning 1on 20th May,2016. We hope that he has all your blessings and wishes for his very first birthday. You ought to treat the mycob infection with at least 4 antibiotics and for at least 3 years. Maybe IV to begin with. Make sure the serum concentrations are OK. Choose the antibiotics based on the mycob isolate. You can measure serum IFNg to monitor the activity of the disease (the higher the worse). Also you ought to treat any other infection (e.g. CMV, Salmonella) promptly and aggressively. I do not recommend HSCT(Hematopoietic Stem Cell Transplantation) until there is clinical remission. Once you have clinical remission, we can resume the discussion about how to perform HSCT (with IFNg-blocking Abs). It's been couple of months post BMT treatment. We are going for check up every week. Venudev continue to take his ATT drugs. He had viral infection inbetween and was on antiboitics for four days. March 13th Dr Revathi Raj and I went to New Delhi to be part of PIDCON 2016(http://www.pidcon2016.com/) and to meet Dr Jacinta Bustamante (France) who is expert on this MSMD related research. She suggested to do another Bone Marrow Transplant with additional process as soon as possible. and we met Dr. Neena Kapoor(Director, Blood and Marrow Transplantation Program, Children’s Hospital, Los Angeles). she suggested that firstly control the TB infection and then you can do the BMT. Concidering both suggestions Dr Revathi Raj suggested us to continue the ATT trugs for couple of months and then the BMT transplant again after that. Once again I request you, dear friends, to provide your support for us by donating small contributions to get ready for another Bone Marrow Transplant.